The library is in a home formerly known as the Michael House which was originally located at 300 Lincoln St. in Big Rock. The house was built in the early 1900’s and occupied by Edna Michael and her family. Later in life, she moved out of the home and married Mr. Harbour. The house was originally built by two retired farmers who wanted to move to the village. The exact date of construction is uncertain but 1908-1910 is an approximate time. The large house was converted to a 2 flat- an apartment upstairs and usually the owners resided downstairs. Later, the English Congregational Church bought the home to use for Sunday School rooms. After constructing an education annex, the Church needed the lot for parking space and made the home available to the Big Rock Historical Society. 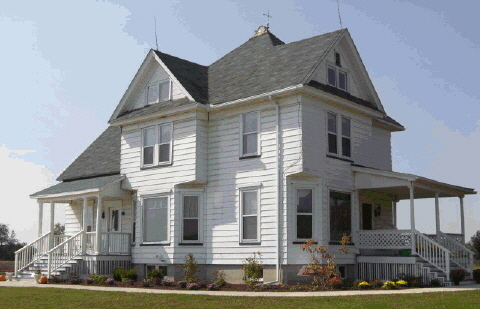 In 2003, the Michael House was moved from the village across the farm field to its present location on the Big Rock Historical site. Every attempt has been made to keep the historical features and splendid woodwork intact. Progress has seemed slow because the home needed to be retrofitted with a lift from the parking lot to the basement and main floor to meet handicapped requirements. This huge undertaking was finally accomplished in 2007. For a complete history of the house complete with pictures and names of residents and owners, please refer to Jane Brickert’s compilation available in the library.